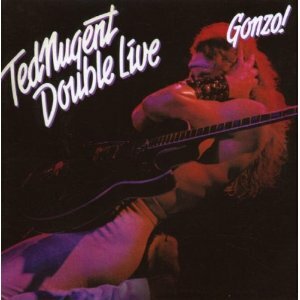 Double Live Gonzo is the first live album by Ted Nugent recorded in 1976 and 1977 and released in 1978. Ted Nugent had been lead guitarist for the The Amboy Dukes before becoming the star attraction in that group and then going solo. His first studio albums – Ted Nugent, Free For All and Cat Scratch Fever – were popular with heavy metal fans. An interesting set list pulling together songs from Nugent’s past with The Amboy Dukes, his self named solo album and Cat Scratch Fever. This is a very good summary of Ted Nugent’s career to date. It acknowledges his time with The Amboy Dukes with three songs, there are four songs from his debut solo album Ted Nugent and two from his third album, Cat Scratch Fever. I will be writing a full review soon but I think this live album is terrific. High energy, extended versions of classic Nugent songs. Here are some videos of Ted Nugent performing live in concert in 1976 and 1977. I think this is one of the finest examples of a hard rock live album and much more exciting to me than Led Zeppelin’s How The West Was Won, Black Sabbath Reunion and other albums by the super league of heavy metal groups. If you want a Ted Nugent album from his classic period, then this is a great place to start. Classic Rock magazine rated it the 37th best live album. Guitar World preferred Intensities In 10 Cities by Ted Nugent. Ted Nugent has never been a critics’ favourite but the fans love what he does. What Do You Think About Double Live Gonzo By Ted Nugent? |If you’ve heard this album, I’d like to know what you think so please leave a comment. Is it underrated and should appear much higher in the best live album lists? Or is Ted Nugent a dinosaur who has no place in a good music collection? Do you like all the album or is there a particular song that you adore? Is this the best Ted Nugent live album? 1976/77 - Double Live Gonzo! This entry was posted in 1970s Live Albums, Heavy Metal Live Albums and tagged 1970s hard rock, 1976 live albums, 1977 live albums, Heavy Metal 1976, Heavy Metal 1977, Ted Nugent Live Albums by Paul Simister. Bookmark the permalink.